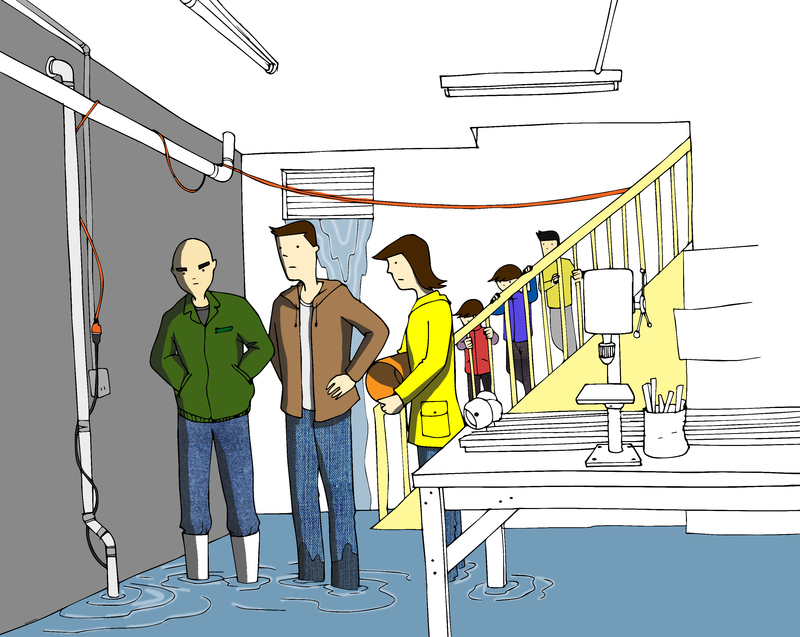 In this scene, David and Sarah have extended backup power to Gerry’s basement and the sump pump is now running. Problem solved, right? Well, not just yet. The scene is set up showing everyone staring and unsatisfied with the effects of the pump. The scene is composed so that the parent can narrate it per the text, but invite the child reading it to explore the rest of the details within the scene. Partly in this scene and fully realized in the next scene, is that water is leaking through the window. The child reader can exercise their observation skills and also get a sense of accomplishment upon finding the problem -which is part of the book’s goal of teaching problem solving to the readers. I think that here the concept of leaving the white space on the image really helps. It keeps content and helps build context for the scene but does not distract from the key elements I need the child reader to focus on. I have a backlog of posts, but did focus on working on the pages for the book during the Christmas season. I plan to catch up and establish a better rhythm for this book-as both a project and as an ongoing endeavor. Hope everyone had a good Christmas and a good New Year’s celebration.